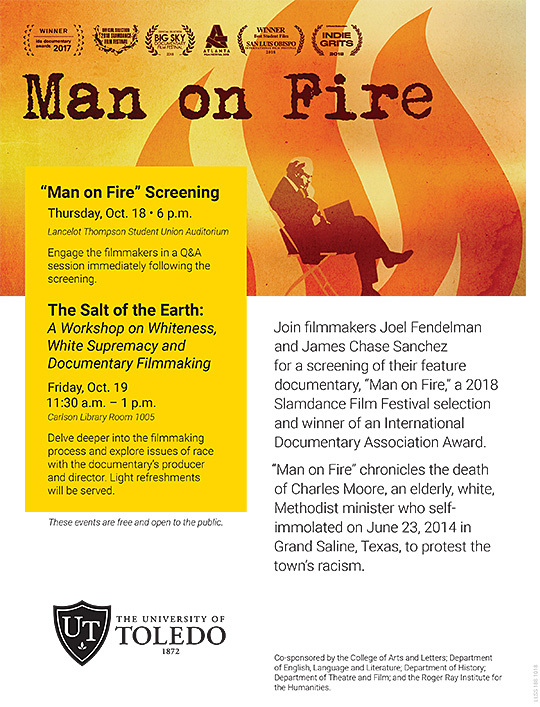 “Man on Fire,” a documentary about racism, will be screened Thursday, Oct. 18, at 6 p.m. in the Thompson Student Union Auditorium. Director Joel Fendelman will introduce the work and lead a question-and-answer session after the screening. However, the workshop scheduled for Friday, Oct. 19, has been canceled. “Man on Fire” focuses on Grand Saline, Texas, which has a history of racism, a history the community refuses to talk about. This shroud of secrecy ended when Charles Moore, an elderly white preacher, self-immolated to protest the town’s racism in 2014, shining a spotlight on the town’s dark past. In the 2017 film, Fendelman and Dr. James Chase Sanchez examined the protest and question the racism in Grand Saline as it stands today. The free, public event is co-sponsored by the Office of Diversity and Inclusion; the College of Arts and Letters; the Roger Ray Institute for the Humanities; the Department of English, Language and Literature; the Department of History; and the Department of Theatre and Film. For more information, contact the Office of Diversity and Inclusion at 419.530.2260. This entry was posted on Tuesday, October 16th, 2018 at 3:47 am and is filed under Arts, Arts and Letters, Events, News, UToday .